Scanner’s running again. 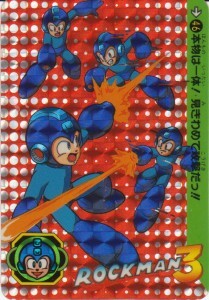 Let’s celebrate with another Rockman Carddas card! This time, it’s Rock vs. the triple threat of evil copies, the Holograph Rockmans! 46. Only one is the real deal! Attack and find which one!! 2 Comments to "The Trouble With Triplets"
At least they’re not trying to give him an identity crisis! That would be fun. If it were a cartoon instead of a game, I’m sure they’d be out ruining his reputation. One would be mean to his friends, another littering a park, the other robbing banks and shooting up police cars. It writes itself.